The key to survival on the modern battlefield rests heavily upon one's ability to remain undetected. The concerns of stealth and concealment are tantamount to all others, and the Mark 4 Tenebraex ARD Anti Reflection Device can give you the tactical edge of invisibility you'll need for a successful completion of your mission. The reflection signature from a glint of sunlight on any optic's objective lens will key the opponent. Once your position is unveiled, they (and not you) have the power to decide the time and terms of engagement. This can result in mission failure, loss of personnel, and a change in the course of battle. The Mark 4 ARD from Leupold consists of a metal honeycomb set into a rugged housing that threads onto the objective of your Leupold scope. 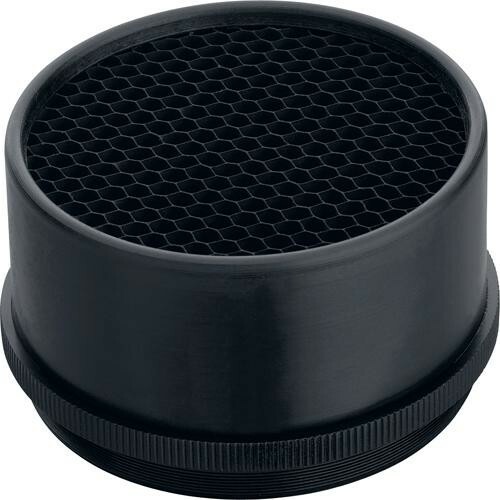 The honeycomb insert inhibits your adversary's ability to see reflections from your scope's objective lens that would otherwise give away your position. Basically, if your opponent doesn't see you, they can't shoot you. The Mark 4 ARD is a cost effective and practical means to hide reflections from optical surfaces without a significant loss of resolution & brightness. ARDs are used by the US Army, Navy, Marines, and Special Forces. Most camouflage is designed to hide the skin or exterior of a soldier or equipment - ARDs hide the eyes. This ARD is designed to thread directly onto the objective lens of Leupold's Mark 4 and Golden Ring 12-40x60 spotting scopes. Box Dimensions (LxWxH) 6.3 x 4.95 x 1.75"
What is the tread on this device?